Designed to subtract the hassle of hauling all your stuff for a day outdoors, so that only the fun remains. It's a beautiful day for the beach. The park. The lake. A game. But it's not, and never is, a good day for hauling the million and one things we humans require for a pleasant day outdoors. 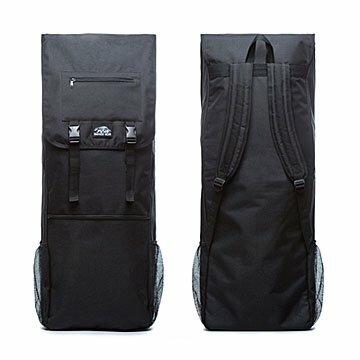 Unless you have a Bottomless Backpack that makes your gear and accessories simple to organize and carry. With all the creature comforts of your backyard in a single, easy-to-tote backpack, you can enjoy yourself wherever you go. Designed to evenly distribute the weight of your gear, the backpack's roomy main compartment holds two adult-sized folding camp chairs. Two zippered external pockets, top and bottom, keep items of all sizes and shapes—including a laptop—organized and readily accessible. Your hands are left free to push a stroller, hold a dog leash, or imbibe a beverage. Back at home, the pack breaks down into a small, easy-to-store bundle. Made in China.